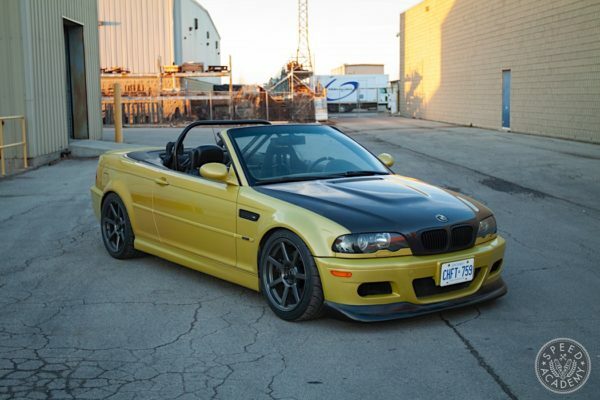 If you’ve been following our Drift Car Build-Off video series on our YouTube channel, then you know we bought the cheapest E46 M3 we could find ($4,000 USD), and that meant accepting the fact the 300,000 km chassis and engine were going to need some maintenance before we could reliably pound on the S54 3.2-liter straight-6 engine while learning to drift in it. 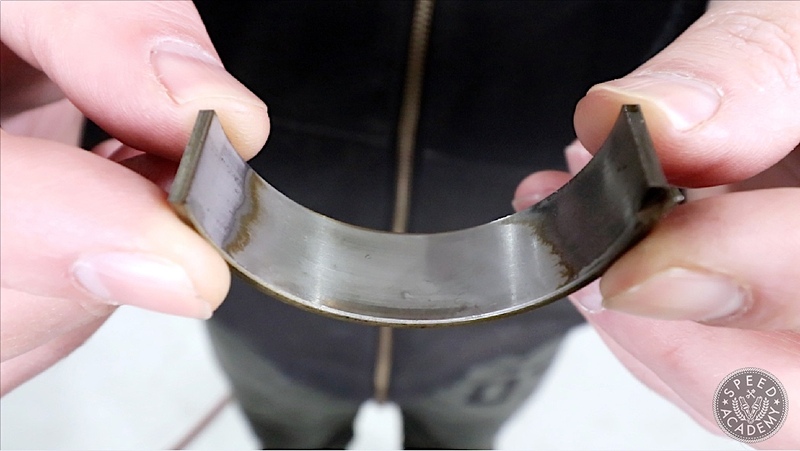 One of the top jobs on our list was to inspect the rod bearings for wear and replace them if necessary. 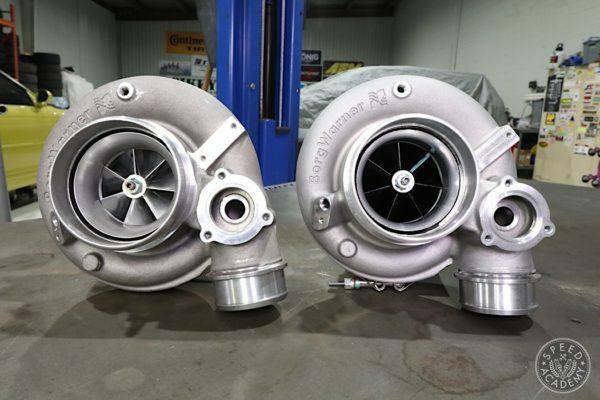 That’s because the S54 M3 engine is plagued by rod bearing wear issues, so much so that there was a recall from BMW to replace the bearings on early (’01 to mid ’03 model year) E46 M3s like ours. 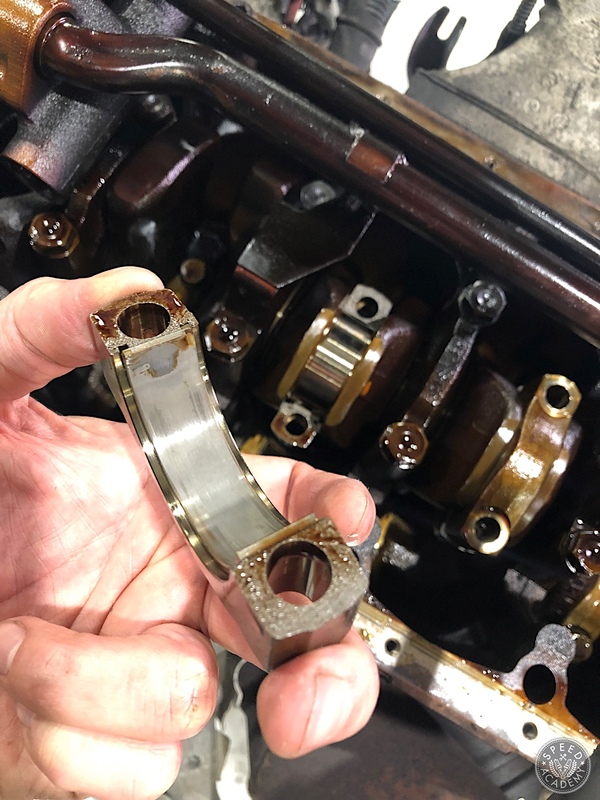 As we could see from the service records on our car, it did indeed receive new rod bearings when the odometer read 50,000 km, but some 250,000 km later how would they look? 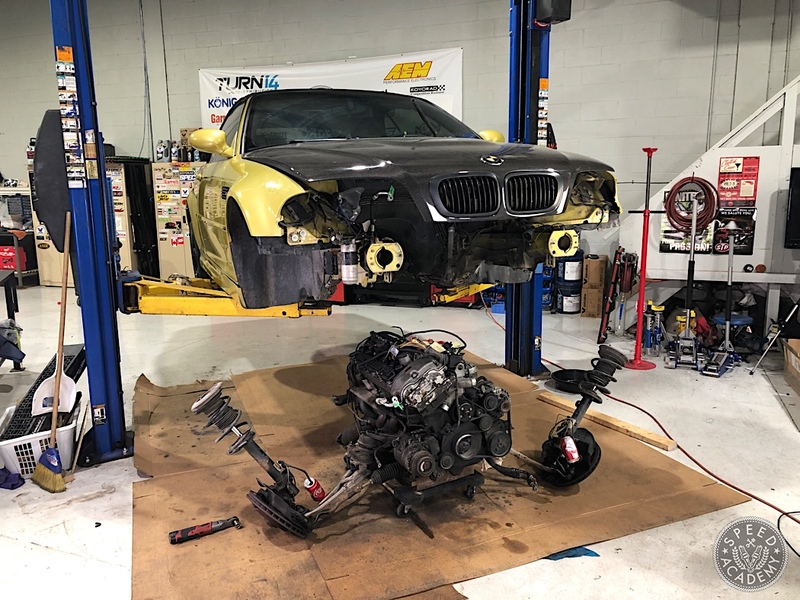 We had the engine out as part of a larger overhaul including a VANOS system rebuild and a general cleanup of the engine and engine bay, so if we were ever going to check the rod bearings now was the time. 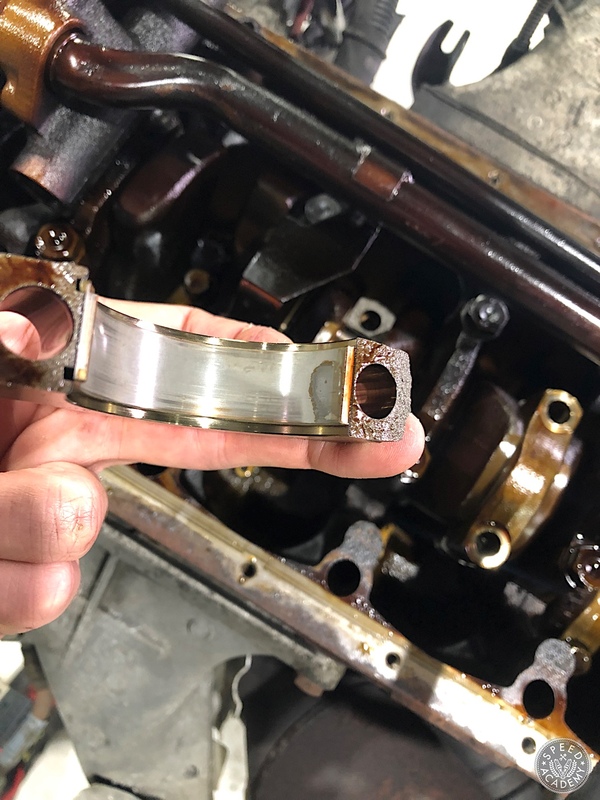 We dropped the oil pan, removed the rod bearing caps and inspected the “small end” bearings, all of which showed wear right through the coating into the softer metal beneath it. 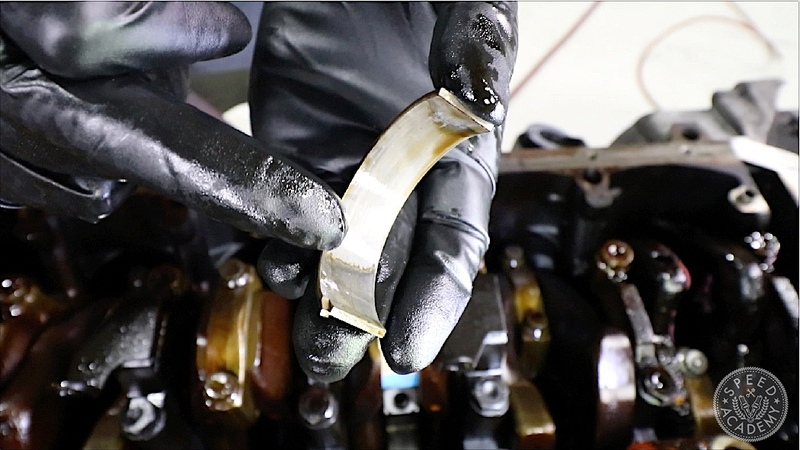 The wear pattern was often near the ends of the bearing, which suggests some ovalization of the bearings, mostly likely due to over-torquing of the factory rod bolts when they were replaced on that factory recall. 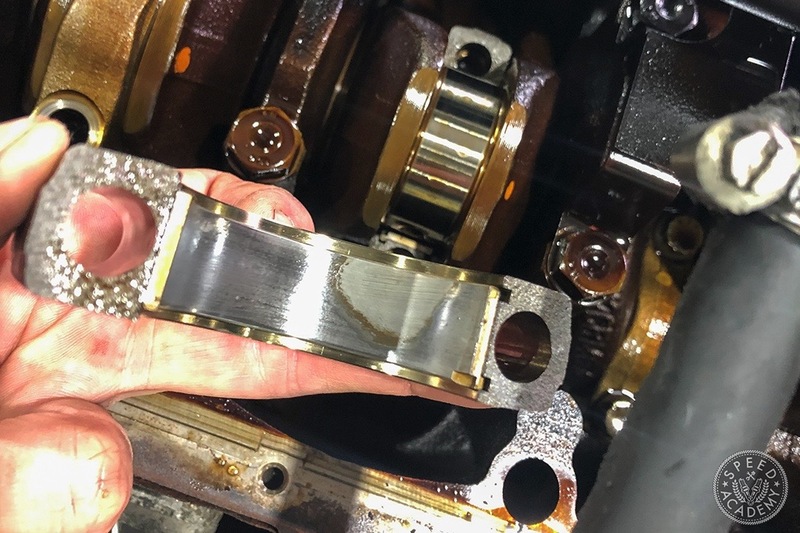 Be sure to check the big end rod bearings as well, since as we learned with our S54 they actually showed much more severe wear and this is apparently typically the case with these engines. So if you’re inspecting the bearings in your E46 M3, be sure to look not just at the rod cap “small end” bearings but also inspect the top side “big end” bearings like those pictured above, where you can see the coating is completely nuked from a wide area across the bearing surface. 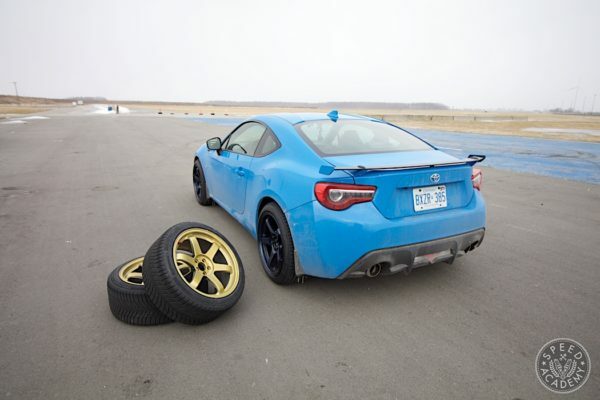 Having done our homework on the available rod bearing kits for this car (including the OE parts option), we opted for VAC Motorsports’ coating rod bearing replacement kit. 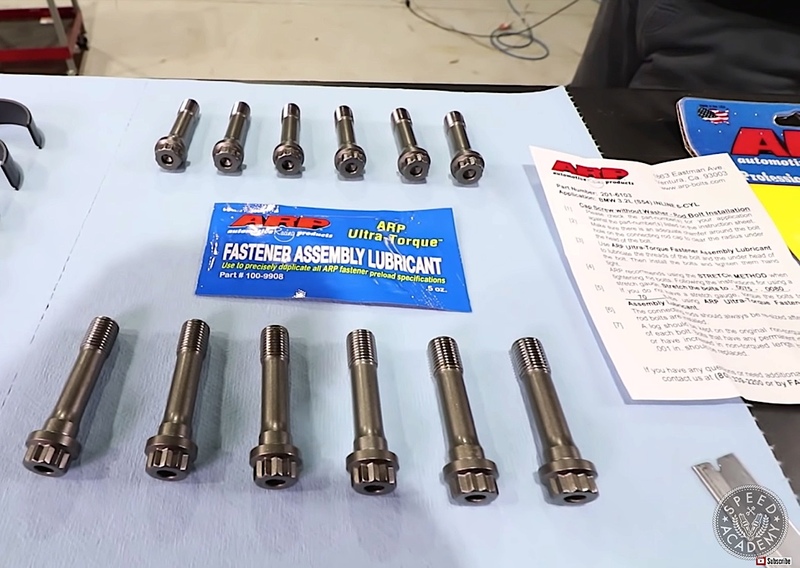 This kit includes a set of ARP rod bolts, which as Tony from VAC explained to us, have two advantages over the OE rod bolts. The OE bolts are one-time use, so once you’ve torqued them to spec, you cannot reuse them, while the ARP rod bolts are designed to be reusable so it gives you the option to periodically check the health of your bearings without having to replace the bolts. 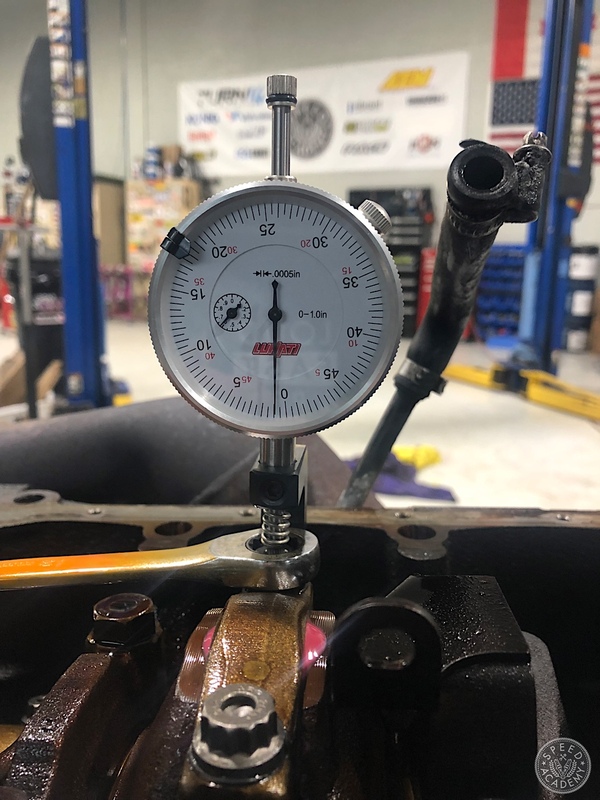 The other reason we like the ARP rod bolt option is that they can be fastened either with a traditional torque wrench to ARP’s specifications or using a stretch gauge. The OE bolts, on the other hand, are torque to angle, a tool very few of us DIY types are likely to have in our tool box, not to mention using an angle gauge with the engine in the car is very difficult and awkward. Add to that the fact that the VAC bearings, sourced from Mahle Clevite, one of the leading bearing manufacturers in the world, are then coated to VAC’s specifications by Calico Coatings, and you’ve got a very well sorted kit that has been stress tested in thousands of engines over the last decade or more, so we felt this was the best and most durable solution for our S54 given that it’s going to live its life near the rev limiter as we attempt to turn its rear tires into sideways-sliding plumes of smoke. As alluded to above, this is a job you can do with the engine in the car. All you need to do is get the car up in the air, drop the oil pan, and unbolt the rod caps. Other than that, you’ll need a torque wrench or stretch gauge like we used, and as long as you follow ARP’s instructions, you should be good to go. We opted to use a stretch gauge simply because ARP lists it as their preferred method, and in general it’s considered a more accurate way of achieving the desired clamping force. 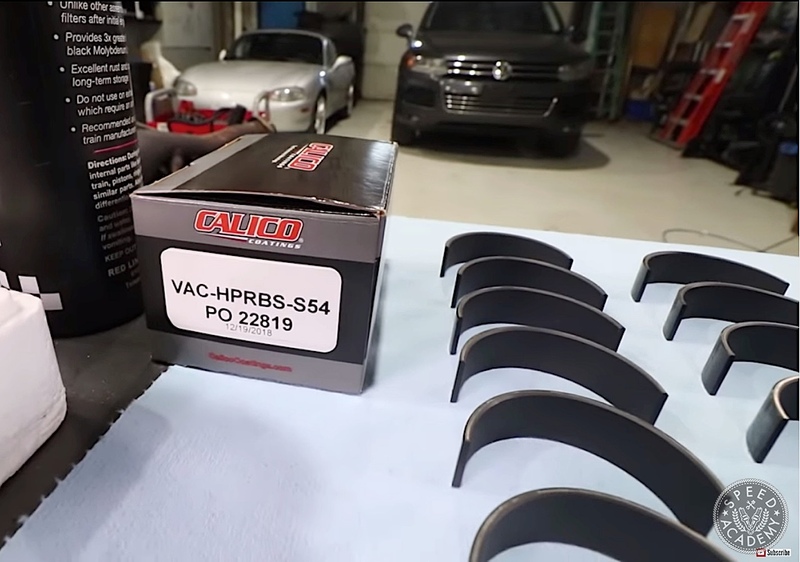 If you’re unfamiliar with how to use a stretch gauge or just want to get a detailed visual on the VAC kit and the overall process of installing new bearings in a S54 M3 engine, be sure to check out our video of the entire rod bearing replacement job below. If you’re more comfortable using a torque wrench, according to ARP’s instructions this is a perfectly acceptable way to do it, but make sure you use a high-quality torque wrench that is in a good state of calibration to ensure you’re not over-tightening or under-tightening the bolts. As you’ll see in the video above, it’s really not that difficult a job to do, as long as you take your time and follow the instructions carefully. We are happy to report that since shooting the rod bearing replacement video, we have driven the car on the street and it’s purring like a kitten. 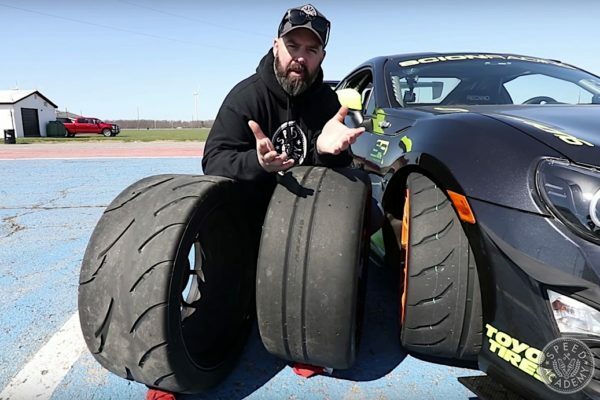 We’ll be taking it to the track very soon (late April 2019), so be sure to check our YouTube channel for video action of the old M3 in action with its fresh bearings doing their job.